Not an image you see every day in soccer. Actually, you almost never see it, especially since I have no idea why Howard has his fist extended. The only way the Bob Bradley era could end, really. Expectations met, but opportunities missed. Acceptable-to-excellent results (they did win the group, after all), but the nagging feeling they had little to do with the coach in charge. Solid in-game adjustments, but only to repair inexcusable starting lineup decisions. Excepting only the five halves at the Confederations Cup–3-0 over Egypt, 2-0 over Spain, 2-0 over Brazil at the half–Bradley’s entire four-year tenure at the helm of the USMNT has been one long Yes, but. So it’s no surprise his team’s World Cup run ends the same way: Yes, they won the group. But they could have made the semis*. Yes, but, Yes, but, Yes, but. Not that the failure against Ghana is entirely Bradley’s fault. One of the things we learned at the Confed Cup was that the U.S.’s first 11 could hang with anyone but that just one or two dents in that lineup–even the wrong late-game substitution–would result in a huge dropoff in performance. Between then and this summer the U.S. took three major dents: Onyewu got hurt. Clark got hurt. Davies got really, really hurt. If there were semi-palatable options for the two latter dilemmas, there weren’t for the replacement of Onyewu, which after the first two matches became sadly necessary. Bocanegra and Demerit were the best we had. Against Ghana, they just weren’t good enough. I actually hate now having to join the Haters’ Choir, but – okay, starting DeMerit was understandable, because – nothing against Clarence Goodson, but I’ve got lots of things against Clarence Goodson. Starting Robbie Findley was slightly less understandable – in other words, insane. Yes, his speed was a factor – he missed those shots very quickly. Starting Clark was incomprehensible. If it’s not fair to say Bob Bradley lost this game, then it’s probably never fair to credit or blame a coach for anything. This is true. Bradley’s excuse that he wanted Clark’s fresher legs makes zero sense–actually, it makes negative sense, more like absolute zero sense–when you consider that 1. Clark has barely played this calendar year while Edu has gotten regular 90-minute performances at Rangers 2. Edu hadn’t played at all against England, only entered at the half against Slovenia, and got subbed off against Algeria after an hour–meaning that Clark had played all of 15 fewer minutes than Edu in the group stage. Sometimes there’s nothing to type but: W … T … F.
So maybe you can make an argument that Bradley wasn’t primarily responsible for the loss to Ghana, that the principal culprits were simply the injuries and a lack of quality in the back, a lack of quality and up top**. But there’s no way to say that Bradley made the right choices for getting the most out of his team at this World Cup … and the entire point of being the coach of the U.S. Men’s National Team is to get the most out of them at the World Cup. Bradley has managed a lot of impressive things during his run at the U.S. helm. But if he couldn’t manage that, and he didn’t, then he doesn’t deserve to be the U.S. coach. I hope, and hope fervently, he’s let go***. But we had that. We had the fightback against Slovenia. 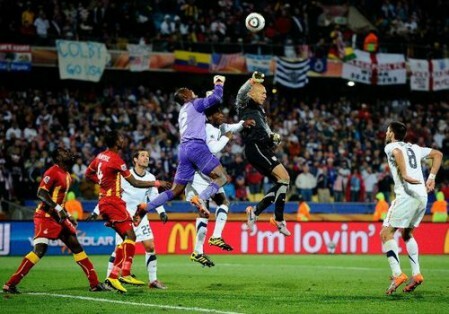 We had Tim Howard standing tall against England. We had a lot. We had so, so much more than what so many more talented sides got. The impotence and decline of 2006 is behind us, and if not for a truly phenomenal strike from Asomah Gyan, it might be far, far behind us. We got the improvement we wanted, the magic we wanted, the memories we wanted. I wish things had ended differently. But I’ve got no complaints. — I’ve been stunned by how much stick Jozy Altidore has gotten in the wake of the U.S.’s departure. No, Altidore didn’t score. All he did was hit the post against England, terrorize the Slovenian defenders and make the single biggest play of that game by knocking down the header for Bradley, make the run to the endline and pass to Dempsey that resulted in the Algeria goal, make the pass to Feilhaber that could have easily resulted in the first goal against Ghana, nearly score one-on-one in that game as he was falling over, and generally work tirelessly across all four games despite playing nearly every damn minute. Also, he’s all of 20 and he was saddled with some combination of Findley or Gomez for a strike partner for a good chunk of his time on the pitch. Maybe he wasn’t a match-winner the way Gyan proved to be for Ghana, but the U.S. had so, so many bigger issues than Altidore. Overall: 2.24 goals per game*. 121 goals, 54 games thusfar. Round 1: 1.50 goals per game. 24 goals, 16 games. Round 2: 2.63 goals per game. 42 goals, 16 games. Round 3: 2.13 goals per game. 34 goals, 16 games. Knockout stage: 3.50 goals per game. 21 goals, 6 matches thusfar. Nice work, FIFA. Nothing like making your most valuable commodity substantially less exciting for the relative chump change earned by unveiling a “special” ball just a few months ahead of the tournament. — Lastly, there’s been a lot of general griping about this Cup, what with the dull early round of games and the collapse of the officiating later on, but 1. we’ve still seen a ton of fascinating matches, haven’t we? The drama of U.S.-Slovenia, Nigeria-South Korea, Cameroon-Denmark, Slovakia-Italy, Serbia-Australia, the shocks of Switzerland-Spain and New Zealand-Italy, the stylishness of Germany against the Aussies and English, of Argentina against Korea. And now we’ve got Netherlands-Brazil, Argentina-Germany, and an almost certain semifinal between the Spanish and whoever emerges from the ARG-GER match. Honestly, what more do the pundits want? *This aspect has been overplayed if you ask me; whatever the perennially unreliable FIFA rankings might tell you, Uruguay was always the heavy favorite in the U.S. quadrant. They’ve got an airtight, athletic defense and arguably the best pair of strikers in the tournament in Forlan and Suarez. They play so infuriatingly consersative they might suckered into a 1-0 or 1-1 penalties match vs. Ghana, but the way the U.S. backline was playing all tournament, there wasn’t that much of a chance they were going to keep Suarez and Forlan off the scoresheet. Is it an opportunity missed? Yeah, since as good as they are, Uruguay still aren’t Brazil or Germany or Spain or Argentina. But it’s not quite as good an opportunity as it’s been portrayed in some outlets. **If Bradley was fully, stupidly committed to leaving Dempsey in the midfield, there weren’t any particularly appetizing options. Herculez Gomez wasn’t built to start, as he showed against Algeria, and Edson Buddle has never accomplished anything for the Nats. They were still both better options than Findley by light years, but Bradley didn’t have any easy option here, to be fair. ***Yet another Yes, but: it’s worth remembering that even the Confed Cup run started with two hideous losses to Italy and Brazil, the second with Bradley choosing to start both the woefully out of form Damarcus Beasley and Sacha Klejstan in midfield. Both were beyond terrible, and I finished watching the Brazil game convinced Bradley needed to be fired immediately. If the Egypt and Spain wins proved how much potential the team had, the start of that tournament showed how much potential Bradley possessed for crippling the team via poor lineup decisions. My assumption was that he could/would get away with a couple of iffy choices vs. England and Slovenia and then correct them in time for Algeria. This was terribly, terribly wrong. Redknapp would be great, but here’s a dollar that says the English hire him after their two big foreign hires crapped out. Hodgson I don’t know well enough to have a firm opinion, but I guess the Americans he’s coached at Fulham have done pretty well under his tutelage. tiger7, oh, he’ll be back in four years. Heh. Might the USSF make (another?) run at Klinnsman? He’s a brilliant mind, both generally and footbally. Further, having lived in the States for twelve years, he understands the way culture and politics comingle here. Given the time and resources, he strikes me as one of the few people with the charisma and pr finesse to help grow the game here even while the Nats struggle for the major WC breakthrough. I guess what I’m arguing is that maybe he should be the chief executive of the USSF, not USMNT’s HC. Or maybe hc then ex.dir. Either way, klinnsman would be perfect. Klinsmann would be my first choice. But I think he’s almost everyone’s first choice. One of the big problems with enticing any non-American to take the job, though, is that you have to wait almost two years before anything truly important happens. There’s next year’s Gold Cup, but … c’mon. It’s the Gold Cup. Is Klinsi really going to want to wait around that long to coach in a game that matters? To spend that much time scouting the likes of MLS and various Scandinavian leagues? I’d hope so, but we’ll see. These are moments that, as Jerry put it a few days ago, I’ll always remember. But they weren’t the moments that propelled my teams to championships. They just gave my teams one more game, which they all lost. Interesting. 2. The feeling I had after the US-Ghana game was eerily similar to the feeling I had after the Iron Bowl this year. A ton of pride in the team and the effort, but a feeling of emptiness because it could have been so much more. It’s a bizarre feeling, and one I’ve only had twice. You know what the Ghana game felt like? Every Auburn game during Tuberville’s last season. The talent was there to win, but I just had a constant helpless feeling throughout the game because of a stubborn coach. Klinsmann is everyone’s first choice…except for US Soccer. He was everyone’s first choice when Bradley was handed the keys…except for US Soccer. However, Klinsmann wanted to come in and revamp the whole system (much needed). This would have gotten rid of the “good ole boy” network that is currently in place. I don’t think Klinsmann’s execution is going to change, so I would say we can forget about him becoming the coach. I thought Gomez played well against Algeria. He created our best opportunities (4 shots on goal, I believe). Findley might be built to start, but he does not have the talent to compete on an international level. Buddle does, at least more so than Findley, but it wouldn’t make sense to have two forwards in the game with their backs to the goal. Personally, I think Findley getting the nod, along with Bornstein over Spector and Goodson (yes, the back line can be shuffled), was more political than anything. With the close ties between US Soccer and the MLS, it makes sense. Bornstein did surprise everyone, though. Typed all this once and saw it vanish into the ether. Sigh. JD: I don’t think the Ghana match and the Iron Bowl are quite analogous for me. The disappointment in the Iron Bowl came in seeing our team play miles, miles over its head (especially on D) and come so close to victory, only to fall short at the end. The U.S. didn’t play over its head against Ghana, weren’t huge underdogs, didn’t even exactly lose a heartbreaker (since they never led)–the disappointment there comes from everything that was lost–the opportunity to make the semis, to keep the ball rolling back in the States, to get another chunk of fans onto the bandwagon for good. So both were terribly disappointing, but I’d say for very different reasons. JB: I was under the impression Klinsi was USSF’s 1st choice last time, but as you point out, they had some differences of opinion and it didn’t get very far. Maybe this time, but I’m skeptical, too. I wasn’t all that impressed by Gomez vs. Algeria. He ran a lot and had that one good shot from an angle, but he also gave away possession multiple times and failed to score on his one golden chance. Buddle did replicate some of the same things Jozy did, but I also thought he was also just BETTER, all-around, than the other forwards. Oh well. Klinsmann was theirs for the taking, but they opted for Bradley. That’s why I say he wasn’t their first choice. Wrong wording probably, but eh. I think it says a lot about US soccer to have coaching concerns after coming in second at the Confed making it to the knockout round of the World Cup. We’ve come a long way. And I don’t mind if strikers lose possessions if they’re also creating chances. It’s expected. The Altidore second half shot that barely missed would have brought the US soccer house down and brought in massive amounts of fans. His strength couple with ball control was NFL worthy. Watching in slow motion the Ghana defender try to body him only to be bounced off like Bosworth then the shot that just didn’t go at the right angle, had me so excited yet crushed. I expected us to beat Ghana too, Jerry, and I didn’t think we had a snowball’s chance in hell against Alabama. I agree that the analogy differs there. But the feeling was the same. It was the “yes, but” feeling you described. Yes, we played well and I’m proud of the accomplishments, but it could have been so much more. So right on Clark & Finley. I was beside myself to see them in and then when Clark did what he was bound to do, and then made it easy on the coach by getting a yellow card, I knew we were in trouble. Findley has no business even playing soccer. He should go run track. Disappointed in how Tim Howard finished the cup as well. Out of position on the goals. I agree Bornstein was and unbelievable surprise especially considering how he performed in friendlies leading up. If we can get Klinsmann, we have to take him. In closing, yes injuries hurt us, Davies brings a dimension no one else on the team has, but Ghana was missing a player that is better than we have on the team. I think Howard wasn’t at fault on the second one. He’s got to come out and close the angle some, and Gyan just hit a tremendous shot. But that first one gets more and more baffling every time I see it. What the hell is he doing? Good point about Essien being gone.